You’re getting married and are in the planning stages of creating your fairytale wedding. You have made some decisions regarding your ceremony, venue, dress, music and now you are preparing to invite all of your friends and family to share in the happiest day of your life. An invitation to your celebration can be conveyed by word of mouth, telephone, text message, e-mail, fax or as in the olden days, by personal carrier. Today most couples choose to send their invitations via regular mail. Wedding etiquette requires that you include the venue, date, time of the ceremony and reception, directions, and an R.S.V.P. It is common practice to include a separate self-stamped, per-addressed response card and envelope. Some couples include the notation, black tie or black tie optional if they are planning a formal or semi formal affair. The invitations that you send to your guests sets the stage of your upcoming celebration of marriage and you want your invites to reflect your personality and bridal theme. So where do you begin? 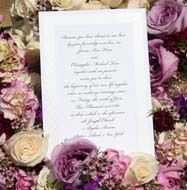 One of the first items that I discuss with brides regarding their invitations is - their budget. Do you want to go all out with elaborate invitations, or is just getting the information to your guests what is important to you. If cost is not an issue, take a trip to a stationery store, look through their books and choose an invitation that represents your bridal and color scheme. 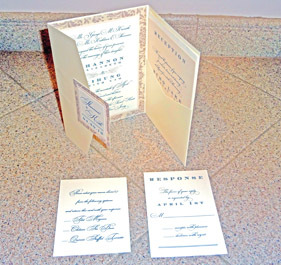 Elaborate invitations with gold lettering, embossed on linen, high quality stock paper, including the response card and envelope, reception card and any other enclosure imaginable, can cost around $25 per invitation. The above invitation is quite elegant. Notice that it has a response card for the dinner choices as well as an attendance response card. If you notice there is a flap where the directions to the church and other instructions are included. Not only is this invite beautiful, it is functional and will help your guests keep all of your information about your wedding day in one convenient place. 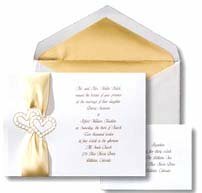 You can print your own invitation on stationery that you have chosen from a stationery store or you can purchase a box of 25 invites that include: the invitation sheet, response card and envelopes for around $2 per invitation. Staples and craft stores have nice selections to choose from. 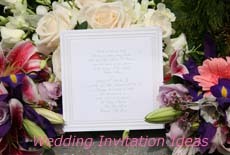 Ordering your invites on the Internet is easy and will not blow your budget. If you are having a formal wedding, it’s a good idea to stick with traditional invites that are printed in black or gold ink on ivory, white or ecru stock paper that matches your bridal gown. It is acceptable to choose other colors but I recommend sticking with the more formal invite rather than choosing balloons or geometrical shapes. It is perfectly acceptable to incorporate your wedding theme into your invitations. If you are having a Valentine's theme, you may choose white card stock with red printing and embossed hearts on the paper. A Cinderella wedding theme invite could have a picture of a bride and groom standing in front of a Cinderella bridal coach. Invites for spring and summer weddings look best with pastel colors. 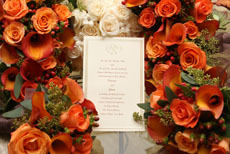 Deep colors such as; maroons, dark greens, browns, oranges, reds and harvest gold’s look best with winter and autumn weddings. Choosing the “right” wording can baffle any bride, especially since the family unit has changed and the host of the wedding can be the couple themselves, bride’s parents, possible step parent, groom’s parents or any combination of the above. I recommend discussing the wording of your invites before you sign off on the printing. Look in wedding books, talk to some of your recently married friends, and check the Internet for wedding invitation ideas and suggestions to help you decide what you wish to communicate in your invite. The style of the font that you choose is entirely up to you and what you want to convey to your guests. A more modern look can have a bold type set, while a more traditional affair can have a script font. Wedding Invitation Ideas with an inner card. 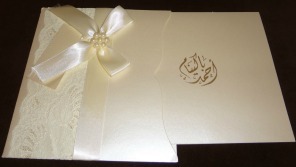 The above invitation is both elegant and traditional. The inner card has a gold emblem and the information is on the back of the card. Clicking on the links below will provide you with more tips and inspiration to help you with your invites. Click Here to read our disclosure regarding affiliate and advertising sponsors. Click below to see beautiful jewelry and accessories.